If you are using Windows then you know how frequently would have to kill an application or process or service that stops responding. Ideally we would be using the default Windows task manager to find the application or process to terminate it, but sometimes in spite of doing this the applications or processes won’t get terminated and continue to stay. 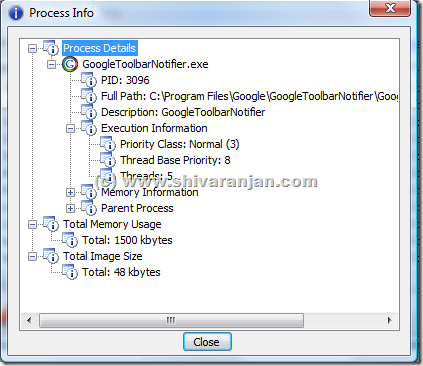 In such cases we require applications that can specifically do this task, we have already covered a similar freeware earlier called Process Assassin. 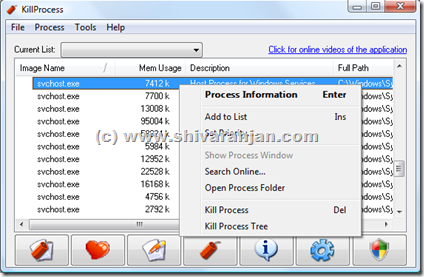 KillProcess is an application assassin that can kill applications, services and processes quickly and with single click. 1. KillProcess can terminate or kill an application or process or service quickly. 2. The speed at which the application or process can be killed depends upon the speed of the computer rather than the operating system settings. 3. Multiple processes or applications can be killed or terminated simultaneously. 4. You can create kill lists in which you can list the applications or processes or services that you want to terminate. If you invoke the list KillProcess will kill all the applications or processes listed in that kill list. 5. KillProcess can even kill Windows system protected processes which is not possible in the regular task manager of Windows. 6. The following information about a process can be found out: PID, path of the process, execution information, priority class, thread base priority, threads, memory information, parent process, total memory usage and total image size. 7. The application is a available in portable and regular flavours. We tested this Windows XP and Windows Vista and found no issues. Pad 3 is now known as just the i – Pad. doors which may just increase the resale value of your home.